1) Cherry Robe Coat, $149.99 from Forever New. Right now I seem to be obsessed with coats. Maybe it's because they're warm, versatile & look so glamorous. I love this one, the collar reminds me of old Hollywood films & starlets wearing strings of pearls and retro sunglasses. 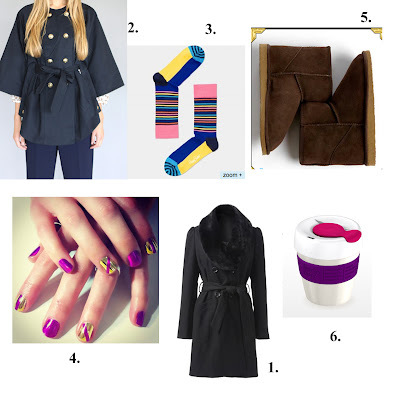 2) Winter Cape, $250 from Hi There by Karen Walker. As well as coats, cape envy has struck me as of late. This one is a beauty. 3) Happy Socks, $24.00 from Wocolate. In Winter, socks and tights become my best friends. Who doesn't like cute ones like these? They'd be perfect to brighten up one of those rainy days spent indoors. 4) Signature Nails, $75 by Leah Light. Winter certainly isn't pedicure season, but it is the ideal time for pretty hands to be showcased! Leah's going to be keeping my nails looking gorgeous this winter & I love this combination of Colour Gloss+Minx she's done. 5) Peter's Famous Homeboots in Espresso Brown, $84.92 from Peter Alexander. Maybe I'm a little bit psychic but I can say with certainty that I'll be owning a pair of these very soon. They're discounted at the moment so if you're after some, I suggest you track yourself down a pair. 6) Reusable Coffee Cup, $18 by Keep Cup. These have been all around campus lately. I love that you can build your own & customise the colours to suit you. Think of all the takeaway cups you won't be using, and the fact that some cafes offer discount to people with reusable cups. Sold. 7) Superfine Pansy Pendant, $269 by Karen Walker Jewellery. As well as bright, statement necklaces I love dainty pendants like this. It's a beautiful colour too so it can be worn with most colours. 8) Prep + Prime Highlighter in Light Boost, $23 by MAC Cosmetics. The vibrance our skin possesses in summer is never quite the same in Winter. With this highlighter though, a soft wash of colour is added to the skin, under-eye circles are concealed, shadow lasts longer....the benefits are endless! 9) Dora Cable Fingerless Gloves, $14.99 from Forever New. Like the homeboots, I can say with certainty that I will have a pair of these very soon. Fingerless gloves are more practical, and won't hide your signature nails. 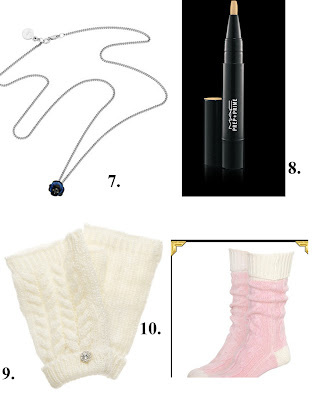 10) Signature Bed Socks, $42.42 from Peter Alexander. My new homeboots wouldn't make the most practical choice for bed. These bed socks however, should do just the trick. There's no reason for your feet to freeze at night now. 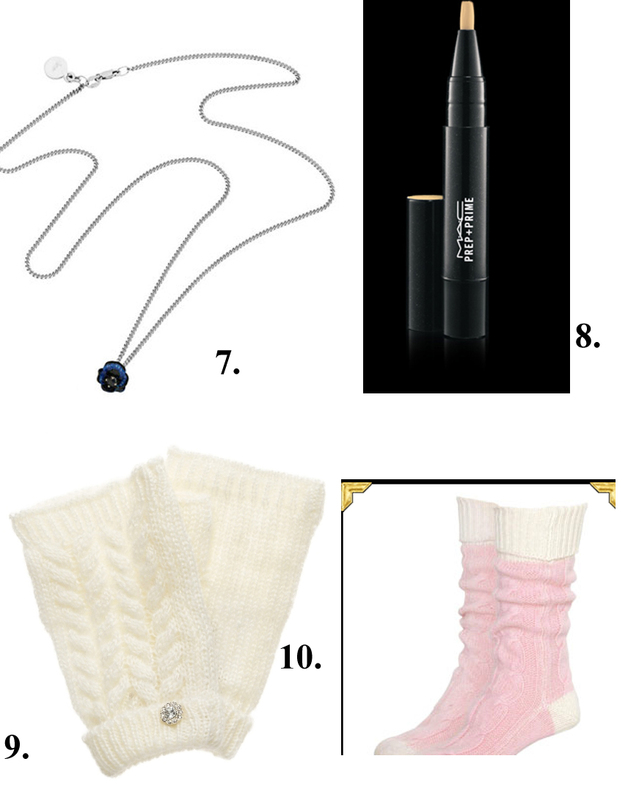 Forever New, Karen Walker, Wocolate, Leah Light, MAC Cosmetics, Peter Alexander & Keep Cup. -All pricing is in NZD except for 1, 5, 9 & 10 which are in AUD & 8 which is in USD. -All images have come directly from these stores sites & the Nails image is from here.